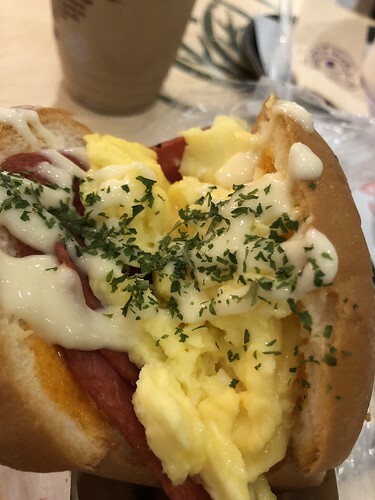 [Food Review] Egg Stop – Modern Sandwich on the go! 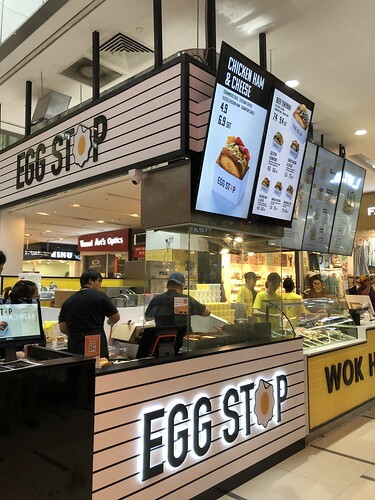 Guess everyone would have heard of this shop “Egg Stop”. I really happened to chance on this because I went down to Paya Lebar’s OCBC Bank to look for my insurance agent, and I saw many people queueing for it. Furthermore, the image of the food kept piquing my interest, so I went to ask my agent if it was nice or not. I was quite surprised when I heard her review. 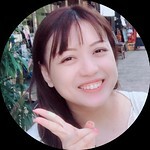 But I guess everyone would have different opinion, and it also depends on what you choose. For me, I decided to go for the safest bet, which is the Chicken Ham & Cheese ($4.90). Why I say that this is the safest bet is because, chicken ham and cheese always go well together. 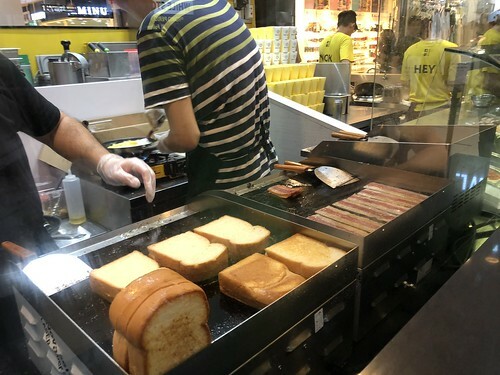 I didn’t get to try the Signature Sandwich which consists of caramelised onions and eggs because my agent told me it was so-so, so I went to try others. The beef teriyaki was also out from my list because I’m not a beef lover, and I rarely eat beef due to religion. However, there are times I do eat, depending on the situation, so I’m not a 100% buddhist. Please don’t criticise/flame me for that. Anyway, their toast consists of a thick toast where they insert the fillings at the top. Didn’t take a good picture of it because many people were crowding to see how the sandwiches were made. Partly is also because I knew the wait was long, I decided to go to the money changer to change some money to ringgit. By the time I went back, my order was already done. I didn’t eat it on the spot because I had another appointment at SingPost Centre. You can see how nice the sandwich is from the top. Anyway, below is purely my own review of the sandwich. The mayonnaise used is not the usual one that I used from Japan, and it is more on the sour side which compliments the scrambled egg really well. The ham is a little charred but still okay. You have to eat this hot because the taste do change when it gets cold. And the crust is pretty thick at the end with no ingredients. Meaning to say that you’re eating plain thick toast at the end, which was a difficulty for me as I never like eating thick crust on its own. But overall, price and taste wise are definitely great if you’re getting something simple. Prices for beef teriyaki and avocado egg can be on the high side, and I find it alright because you’re paying for premium ingredients. I’m not sure if I’ll be going back because they just open recently in Paya Lebar Square, and as a west-sider, I rarely go to the east side, and try not to unless required. But after reading a few reviews here and there, I saw that they will be opening an outlet in Clementi (YAY!!) around September, and another outlet in Jurong Point around November. The problem now is that I’m not even sure I will still be around in Singapore by then because of my job. Well, if I have the chance, I probably might want to try others. I guess I might give the beef teriyaki a try.